Caravan Clubs: Practical Caravan - find the right caravan club for you. 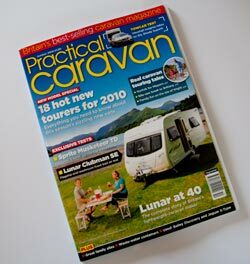 If I was to buy one caravan magazine it would probably be Practical Caravan and the same would go for most caravan owners. It is a real grown up magazine that doesn’t try too hard but does just enough to stay ahead of the competition. The same can be said of the companion web site. Full of useful information and there’s a very active forum. The site is split into three main sections, Planning Your Holiday, Buying a Carvan and Solving your problems. So if you are just thinking about buying a caravan, are looking for ideas for your next holiday or are having a problem with your caravan, the Practical Caravan web site covers all bases. Please add a comment or club notice. Can anyone tell me how to drain a Compass Omega 482 for the winter, please. If you are looking for good value caravan insurance give Caravanwise a try.